Jarmuli radiated outward to Asia, the world, the solar system, the universe – it was every child’s incantation in school, and even now, when he wanted to be out of the reach of his aunt and uncle, he dreamed of living on Jupiter and sleeping under its many moons. When his teacher had told their class it had sixteen moons he had wanted to ask her if this meant that there was a full moon on Jupiter every night. Or were there crescent moons and half moons and round moons all at once in that other sky? Sleeping on Jupiter. It’s a rather odd title, perhaps. But if your life has been so harshly effected by those around you, if every day means pain and suffering, Jupiter may be the very place you long to go for respite. How brave it is, then, for Nomi to back to the place which caused her the most pain in her life. For it is in the ashram run by Guruji that she is told one thing, but lives another. How can a young girl, whose father was brutally murdered in the family’s hut, whose mother and brother have disappeared in their attempt at escape, not believe these words of hope? How can she know that they are lies? She is hopeful, at first, until the actions of the Guruji prove who he really is. Interwoven with her story are those of several others. There are the three old friends, Vidya, Latika and Gouri, who meet Nomi on the train from Calcutta to Jarmuli. They are bewildered by her hair wrapped in beads, multi-colored thread, and braids. They cannot imagine how such a person looks this way, especially as they struggle with the day to day lives of their own which are so different from hers. And there is Johnny Toppo, an old man who runs the tea stall by the beach in Jarmuli, offering customers tea with ginger and cloves, tea with lemon, tea with milk and sugar, and if they wish, sweet or savory biscuits. (The care with which he takes to make his tea caused me to long for a cup so badly that I had to go to our local Deccan Spice for a cup of my own.) But his name has not always been Johnny Toppo, and he has not always operated a little tea stall to serve those who come to the beach. There is Suraj, son of Vidya, who has unbeknownst to her also come to Jarmuli in order to report on the temple for the television company which employs both him and Nomi. He carves little boats every year, as his father and he would do when he was young, and set them off to go where they may. He can barely contain his temper, or his drink; his emotions threaten to overcome his reason nearly every day. But, it is Nomi’s life which is the focal point. Nomi’s life which caused me to highlight passages again and again in my kindle. Her courage to face her past, to triumph over the tragedy that her childhood was, is a fascinating story. And while I may say to myself, “This is just one little girl’s story, one little girl who lived in India under the cruelest conditions,” I find that Anuradha Roy has made her heroine’s life one for us to relate to. The elegance and beauty with which she writes takes my breath, and causes me to realize again how rare it is to find a book whose writing, story and relevance are equal in excellence. This novel surely deserves its place on the Man Booker long list. And as so often happens to me when I read from such a prize list, the first book I read is the one that wins. I would not be surprised, nor disappointed, if Roy took the prize for 2015. My thoughts on it here can not possibly do it justice. I am so impressed you have already managed to read the first one and review it, looking forward to your next ones 🙂 I have only read The God of small things by Roy and I remember it was quite heavy in digesting…. You will only be impressed for a brief time; school starts next week, and thus my days for reading come to an abrupt halt! I thought the authors were the same too, but the author of The God of Small Things is different from Sleeping on Jupiter. 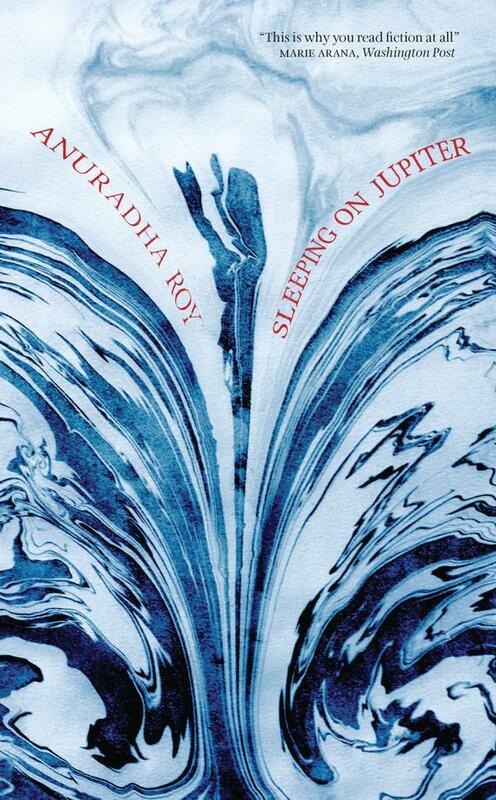 Although their last names are Roy, look at how close they are: Arundhati Roy (The God of Small Things) and Anuradha Roy (Sleeping on Jupiter). Still, both books are so beautifully written! Wouldn’t it be wonderful if Sleeping on Jupiter won the Man Booker as The God of Small Things did? Can’t wait to read this one now! I’ll come back around and comment further after I do. And on a more shallow note, I love this cover design. I can’t wait to discuss this with you, Frances! I have loved it so much I wonder if I’m coming to the rest of the list objectively. When I was reading for the IFFP, the first book I read for both 2014 and 2015 was the one I wanted to win (which it did this year). Am I saying I hope this wins? Perhaps. I haven’t read the others yet, but I would be so happy if this did. As for the cover, it is beautiful! It reminds me of the rings of Jupiter (Jupiter has rings, right?) and the pictures of Earth melting together. I am so happy you like Anuradha Roy’s writing. “THE GOD OF SMALL THINGS” was my introduction to this gifted author. I will be reading “Sleeping on Jupiter” soon. I am reading “Confession of the lioness” by Mia Couto and “My several worlds” by Pearl S. Buck, her biography of sorts. What a gifted writer she was, sentences just flow beautifully on the pages of her books. My mother intrduced me to “The good earth”, good choice, it started my love for books, and foreign authors. As I mentioned to Ally above, I, too, thought that they were the same author. Even though they’re different, though, I doubt you’d be disappointed in Sleeping On Jupiter. They are borth such exquisite writers! I just read Pearl S. Buck’s The Good Earth in July, for the third time. I love that book; you’re so right about how the sentences flow beautifully. And so simply! I wonder if that’s where my love for “foreign” authors began…if I think hard about it, I think it would be with Haruki Murakami’s work. I so hope A Little Life is chosen —it moved me so. A Little Life is not little! I think it’s one of the longest books on the long list, and I didn’t read it when everyone else was because the cover distressed me so much. But, I’m looking forward to reading it. One of the things I’ve discovered about translated literature up for prizes, and these books, is that they have much sorrow in common. I wonder if that’s one of the “qualifications” of being an award winning book: it must touch the reader in a deep way. I suspect that’s the truth. Thank you Meredith for the correction, the funny thing, for a second I noticed something wrong with the name, I put it aside as my mistake, after all it has been a while since I read ” The god of small things”. I like the premise of this one, that return to the roots and the cultural encounters, although it also sounds like a distressing story as well, how did you find the distressing elements of the book? I have a hard time with “distressing” books. For example, The Narrow Road to the Deep North just about did me in with all its violence. But Sleeping on Jupiter had two elements which softened the upset: the courage and determination of our heroine, and the hope with which the author ends the book. The writing is so very beautiful in this book, and the story unfolds gradually with great compassion so that we can absorb it bit by bit, breathing in some relief at the conclusion. IFFP & now the Man Booker Prize, Go You! In tackling these issues, Roy has used the most potent weapon in a writer’s arsenal – the form of the novel, with its ability to simultaneously be universal and particular – to boldly unmask the hidden face of Indian spirituality and the rampant sexual abuse in its unholy confines. RRP 16.